NEET Toppers Practice Topic-wise Important MCQs asked in previous medical entrance examinations. 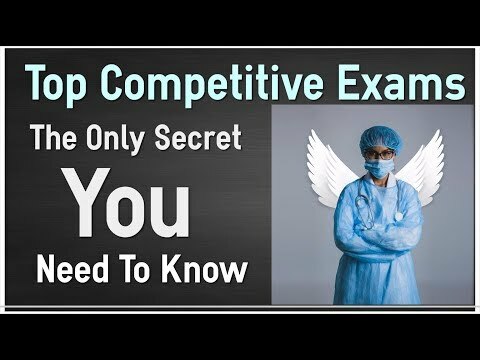 Practicing 25 MCQs everyday will get you MBBS Seat in Government Medical College. 25000 students Join Govt Medical college every year. Do you want to be the one among them? Our Online Courses employ proven tools and techniques like mnemonics, association, mind maps, spaced learning, OC4R to enhance your memory retention and recall. More than 80% of NEET questions cannot be answered with rote memorisation. We improve higher order thinking skills ie apply, analyze, and evaluate. More than 10000 questions to practice with varying difficulty level covering all concepts helps you revise and review effectively. 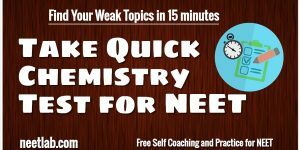 Mock test and previous NEET tests help you to identify weak topics and coach you to gain greater insight on the topic. We guarantee Medical Seat if you can clear the fourth Level of NEETLab Challenge. Click to Take Level-1 challenge now. 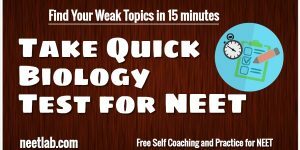 Take this quick test (should not take more than 15 minutes) and identify your weak topics.